Need a gift for the die-hard San Diego Padres fan? 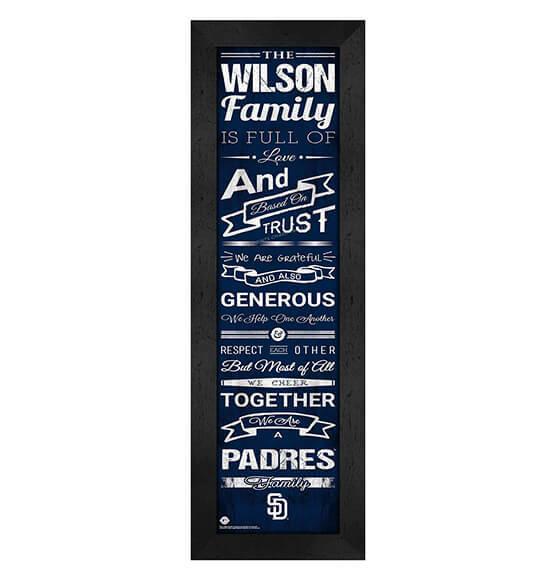 Our Personalized Family Cheer San Diego Padres Wall Art is an ideal baseball gift for co-workers, friends or family members who have a love for the Pads — and for this iconic all-American game! Featuring a sweetly special saying about family in San Diego Padres' team colors, our thoughtful, custom MLB baseball gift is guaranteed to thrill any fan. This vertical-perspective, high-quality print is easy to customize and protected in glass and is MDF vinyl-wrapped for long-lasting quality. This wall decor includes an installed sawtooth hanger for easy, drama-free hanging.